It wasn't just the violent Prohibition-era gang wars that were dangerous to Americans drinking homemade moonshine and bathtub gin. According to the Dec. 26, 1922 edition of the New York Times, five people were killed in the city on Christmas Day from drinking "poisoned rum." That was only the beginning. By 1926, according to Prohibition, by Edward Behr, 750 New Yorkers perished from such poisoning and hundreds of thousands more suffered irreversible injuries including blindness and paralysis. 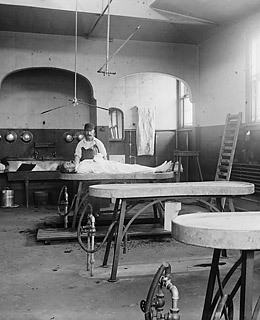 On New Year's Day 1927, 41 people died at New York's Bellevue Hospital from alcohol-related poisonings. Oftentimes, they were drinking industrial methanol, otherwise known as wood alcohol, which was a legal but extremely dangerous poison. One government report said that of 480,000 gallons of liquor confiscated in New York in 1927, nearly all contained poisons.